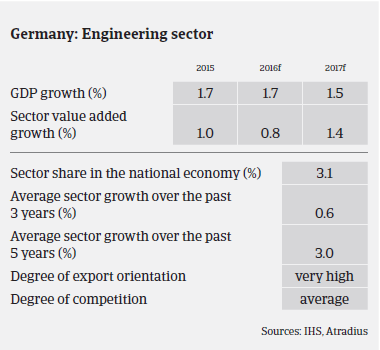 The German machines/engineering sector is a backbone of the German economy, accounting for 3% of GDP, and order intake in the machines segment is a good indicator for the development of German manufacturing as a whole. German machinery/mechanical engineering production increased 0.8% in 2015 and 0.2% in Q1 of 2016. Many German machinery companies are world market leaders in their individual segments. The general outlook for 2016 and 2017 remains positive, with many businesses recording high order backlogs, especially in segments that provide machines to the automotive industry. The business sentiment of shipyard-related machinery builders’ has increased due to increased orders, especially for cruise and special vessels. After a market consolidation in recent years the solar-related machinery segment has finally rebounded. In 2016 turnover is expected to increase 0.8%, mainly driven by exports. That said, due to its high export ratio of more than 75%, German machinery performance is highly dependent on demand from abroad, and therefore susceptible to certain risks (deterioration of the global economy, rising geopolitical risks, exchange rate volatility and shipping costs). The industry is characterised by high investments (IT and equipment) and increased labour costs. Machinery businesses´ equity ratio is higher than the German industry average, as necessary investments can often be financed by own resources (cash slow, shareholder and/or mezzanine loans). Due to this, many machinery businesses are not excessively reliant on bank finance, and bank indebtedness is rather low. Given the positive net cash position and the current low cost of financing, many machinery businesses have the opportunity to further strengthen their position via cash and debt-financed acquisitions. Most machinery exporters with a strong focus on Russia were able to at least partly compensate declining revenues by increasing exports to the EU, the US and Asia, thereby limiting their profit losses. However, some smaller players dependent on trade with Russia, who already had financial difficulties before the Ukraine crisis, are now facing more troubles. Compared to other German industries, the machinery/engineering sector’s payment behaviour and default/insolvency rate is still good. The amount of non-payment notifications is expected to remain low, and insolvencies are expected to level off in 2016 after decreasing in 2015. Given the general financial strength of Germany’s machinery businesses, our underwriting approach remains generally relaxed. 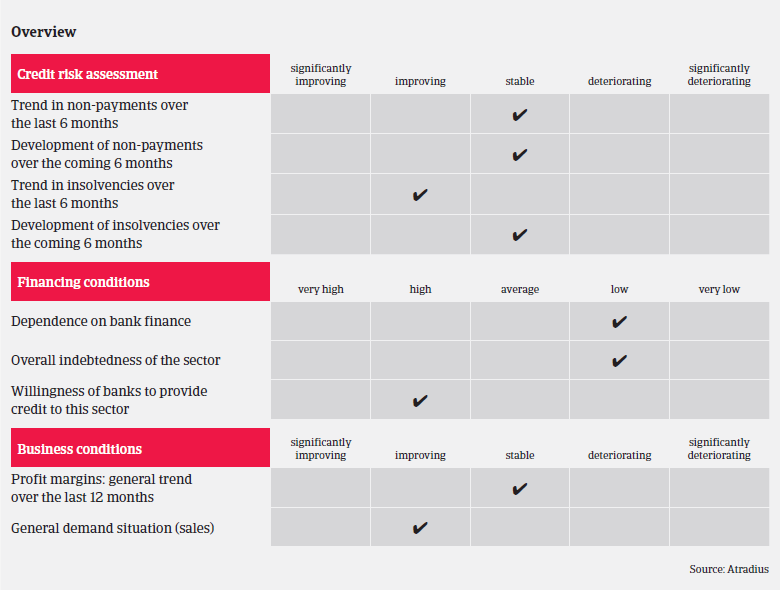 We still need to see financial data such as balance sheets, quarterly reports, forecasts and bank commitments when assessing the creditworthiness of buyers in the sector and will sometimes recommend that our clients impose retention of title or other forms of security. That said, machinery businesses involved in the paper/print subsector face more structural problems, as society in general becomes more and more ‘digital’. This shift has resulted in shrinking profit margins, and many companies are still restructuring to adjust their production to customer needs. 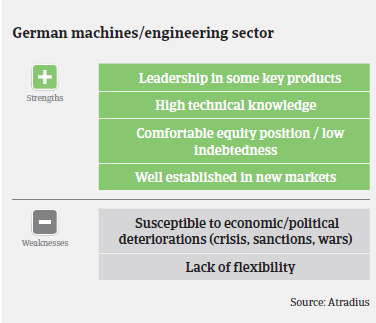 Another segment with difficulties remains textile machinery, but this subsector represents only a minor share of the German machinery industry. German agricultural machinery producers have encountered difficulties following high investments in Russia and Ukraine prior to the conflict.